This may be yesterday’s news (actually, it’s eleven days ago’s news), but it’s still great news that the FEI has decided to speak for the horse. The 24th edition of the FEI Rules for Dressage Events will now make it clear that any horse with “fresh blood” on its body will be eliminated from competition and that elimination will be final, with no appeal. I join in the chorus saying “thank you” to the decision makers who adopted the new rule at the FEI General Assembly. I like to think that all who made their voices heard on the issue made a difference. My voice joined in here and here. 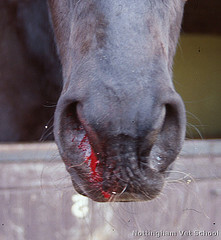 Unfortunately, the blood rules for other FEI competitions put the welfare of the horse behind the potential success of the competitor. It’s time for the FEI to take a fresh look at “fresh blood” in all competitions, not just dressage. I highly expect at some point to get eliminated due to blood with Tucson. He regularly bites his tongue when he’s playing, and has once when I was riding, and he also gets minor surface level bloody noses due to dry weather and allergies. Neither is a health concern for him, but blood can be for so many horses that I think the “greater good” is far more important. Thank you for your comment Net. I hope the day doesn’t come for you when you get eliminated for blood, and I so admire you for believing in the greater good.